The needles have been flying this week. In fact, I finished yet another cowl. I'm managing a cowl a week which is incredible. I remember those days when I could not knit for five minutes and my back would be spasming causing me to be in the depths of frustration and depression. 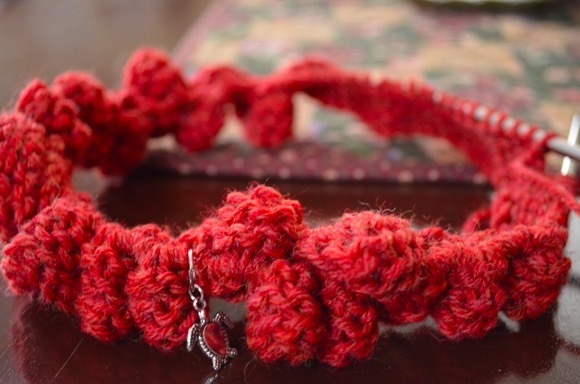 I am loving this pain free knitting spree! The gratitudes are endless. 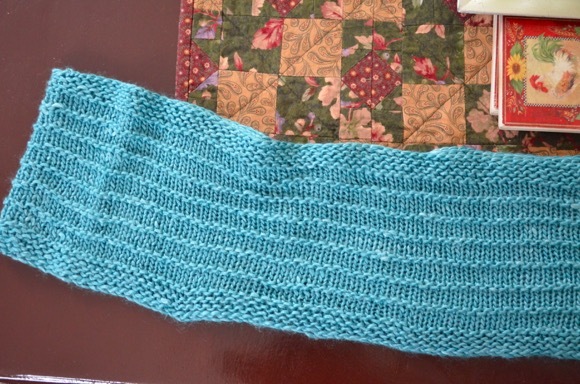 Anyways here is the teal cowl project page. My shawl is coming along, I'm getting close to another increase row where the stitches nearly double. I'm amused that I only noticed the subtle color change when I looked at this photo. I'm enjoying this knit and it's my 'thinking knit'. As opposed to auto pilot knitting, which are the cowls. I've got to have a nice balance of both in my knitting arsenal. How about you? Of course, I cast on yet another cowl, this time in burnt orange. And if you are wondering, I am not tired of the cowl knitting. I'm enjoying the mass production of Christmas gifts to give my family. However, I will be casting on a hat that my sister wants as well as a toddler sweater. Just not yet. The shawl yarn looks like it is lovely to work with. I love those delicate yarns. I love the colour of that finished cowl. The lace shawl looks really pretty, too! But I am not very much into challenging lace projects currently. Nevertheless, I think I will start a shawl which is intended to be a Christmas gift soon. But I am not sure about the pattern yet. Horray for pain free knitting ! Stick with what's feeling good! 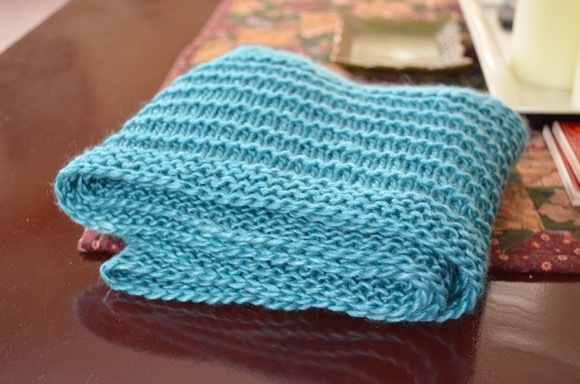 How fun to knit cowl after another each in a different color and stitch! Glad you are feeling better! I'm knitting one of those cowls for a gift too! So happy you are able to knit pain-free now. The cowls will make super gifts and that shawl is gorgeous (such subtle shading). These are fun colors, Karen. It helps to see everything in the carts. My sewing one is a bit squished but oh well. It does the job for now. I have some paper I need to cut down for my stamp cart. And yes, I love my new tea cup. I now have three I rotate throughout the day. So glad your back continues to feel better. It's funny how we can knit one thing - right now cowls for you and perhaps mittens for me for a long time and then we need a change. I so agree, I have to have one project that is easy knitting, one small carry along project, and one that requires more concentration but not many more than that or I get too flighty and feel as if I get nothing knitted. I am so glad there are so many different kinds of knitters in the world. A cowl a week!?!?! Holy smokes. Will you do my holiday knitting for me? I need lots of hats. Thrilled to hear you are pain free, don't overdue it Karen so that you are back to square one. Your needles must be on fire doing a cowl a week as well as adding to the shawl. Love the lace of the shawl. neautiful. 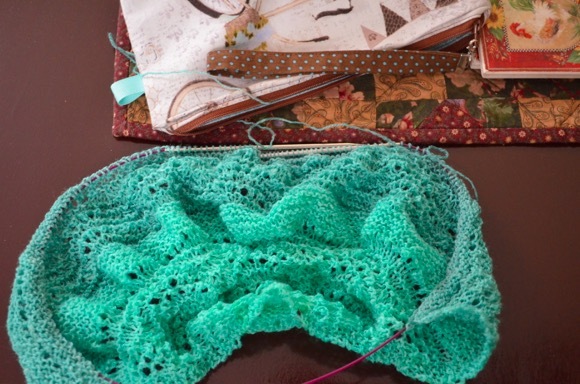 I love slow and subtle color changes and am looking forward to seeing your shawl develop. 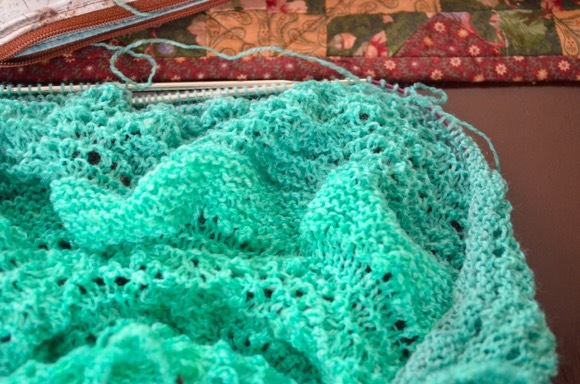 Your gift knitting is really moving along fast; you are so good at planning, organization, and knitting! I'm jealous of your cowl output. I cast on for my first Christmas knit of the year and .... it may be finished by the year 2022. If I'm lucky. Besides being jealous, I'm also in love with the orange you just started. SO fall-ish!